A Robins & Day Vehicle complementary Health Check assesses the current condition of your car, and allows you to make decisions of any work needed on your vehicle. A manufacturer-trained technician carries out the vehicle health check. 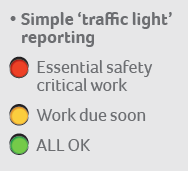 The results are presented in a report, with a simple traffic light system to show you any work that is required immediately or in the future. You are sent a video to your mobile phone clearly showing you the results of the check and any work required.